princesses. 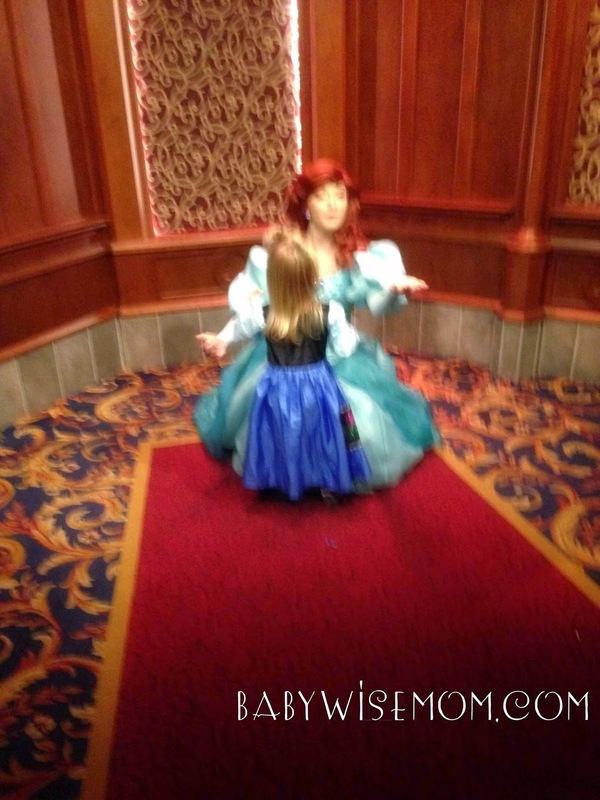 This is her meeting Ariel. This is a summary for Brinley from 27.5-28 months old. Most of this time period, we were on vacation in Southern California. Her sleep was very different. She got a nap one day, but the other days she was awake all day long. She was able to get to bed at a good time most of the nights. By the end of the trip, she fell asleep in her stroller promptly at 8 PM each night. She fought slezsc vaep very hard. She didn’t fight it by crying or anything, she just wanted to stay awake. She would insist she was not tired and she would stay sitting up. One night she started falling asleep sitting up, and I caught her and gently helped her lay down. She slept well in the condo and hotel. She slept a normal night for her–the only thing is she needed some extra sleep since she was not napping each day. On the drive home, she was super good again just like she was for the drive there. She did fall asleep when we were about 1.5 hours from home–so about 10 hours into the drive :). It was 8 PM California time. Ha! While we were on our trip, I didn’t know how she would handle sleep when we got home. I didn’t know if she would go back to sleeping for naps or it if it would take her some time to adjust. She came home and went back to naps with no problem! She also got a lot happier and gregarious once she had a few days of normal sleep. While we were gone she was perfectly content, but she got to where she sat in her stroller quietly a lot. Once she got more sleep, she was more bubbly and giggly. And I must point out, some kids will be very grumpy when overly tired. Some will be hyper. Some will cry. Some get “slapstick” funny. You don’t really know what your child’s disposition is like until you push them to that limit. Brayden is slapstick–everything is absolutely hilarious. Kaitlyn gets more emotional and gets her feelings hurt easily. McKenna gets defiant and tests her limits more. Brinley seems to just be still. That might change as she gets older. Eating was good during this period. She snacked a lot throughout each day. We let her just eat when she wanted to in order to help keep her happy. She has not had a problem adjusting back to normal life at home since we got back. Brinley is just talking more and more. She is talking such long and complex sentences now that it makes people stop and do a double take (not strangers–just people who know her). She has had a bit of an explosion in language ability. Brinley was so good on our vacation. She definitely is my most flexible child. She handled the whole thing better than I thought she would and better than any of my other kids handled things like that when they were her age. I think part of it is that she doesn’t love sleep. Kaitlyn and McKenna like to sleep, so to miss it is upsetting to them. Brinley doesn’t much like to sleep, so to miss a nap every day seemed very pleasant to her. The things we did were definitely things that kept her entertained, which I am sure helped keep her in a good mood. We went to Sea World, Legoland, Disneyland, Universal Studios, the beach…basically entertainment at all times. Honestly at Disneyland, I rarely saw a child crying in the three days we were there. It wasn’t just that she is super special and good (although I of course think she is those things); I think it is a place where kids are just happy. This is her general schedule. When on vacation, she just woke up, got ready, played, ate throughout the day, and then went to sleep. How do you workout nap time with school pickup? My oldest started kindergarten this year and my 3 year old still needs a nap most days but school pickup is right in the middle of nap. We live too close to the school so the bus is not an option because it doesn't go to our neighborhood. We are bussed happily!Can you move nap earlier or later? Or can you carpool so it isn't every day? Or can you leave a babyomitor with a neighbor? If it is the middle of the nap and you are that close, you would be fast and your 3 year old is unlikely to wake. So a monitor might be a good option.